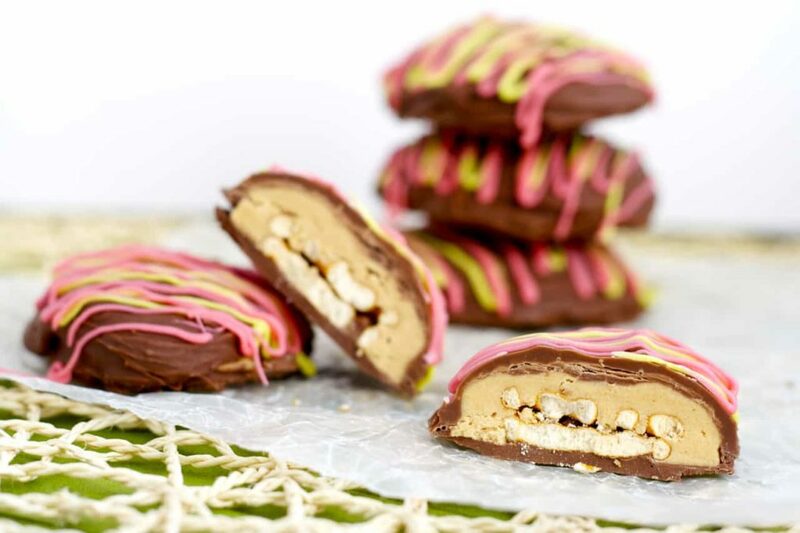 So, anyone else absolutely adore those peanut butter eggs that you can get at Easter time? I suppose they’re basically just peanut butter cups, but hey, they’re in an egg shape and that just makes them fun! This year, after many, many years of telling myself that I would make some at home, I actually did it. I’m quite pleased actually, because seriously? It’s been at least 5 years now that I’ve been planning on making my own peanut butter eggs at Easter. Put homemade candy in the kids Easter baskets. Just for fun. Just because I can. But I have never actually gotten around to making any. No real reason. It’s not like they’re that difficult. I suppose they’re really just too easy to go out and buy! But since you can say that about anything and everything, I finally stopped procrastinating and actually made some homemade candy. Such a good idea. These are amazing. And really? It makes me feel pretty awesome to make candy from scratch. Now if only I could figure out a way of making that candy healthy as well, and still taste just as good. Probably not going to happen. But hey, a girl can dream! Luckily this batch only makes 6 eggs though, so I can’t eat too many of them. Especially if any are going to make it into the kiddos Easter baskets! That was the plan. We’ll see if they make it a whole week and a half though. I hid them in the freezer after the obligatory taste test (obviously I needed to know if they were good enough to share – someone had to do it!) so that they wouldn’t somehow disappear before the holiday. Of course. the kids don’t know I made them, so they wouldn’t miss them at all if they weren’t in their baskets. Maybe they don’t need homemade candy. Kidding. Of course I’ll give them to my kids. I won’t eat them all. Maybe. I should also mention that these have pretzels in them. Because peanut butter and pretzels and chocolate really just belong together. I loved that bit of salty crunch, but you could leave out the pretzels if you just want a plain peanut butter egg. I used milk chocolate, but I think I might use a combination of milk and dark next time, to balance out the sweetness a bit, so use whatever chocolate you prefer. And the tinted white chocolate drizzle on top is obviously optional, but let’s be honest, it’s pretty cute and you should probably do it! You should also probably be better at dipping then I am – and trust me, that wouldn’t be hard. I am absolutely the worst chocolate dipper ever. It inevitably looks like I let my 3 year old do it for me. And now you know the real reason for the tinted white chocolate drizzled all over. It looks cute – and it hides my ineptness. It’s okay, they get all messy as soon as you take a bite anyways – and they taste great regardless of how well they’re dipped! At least that’s what I’m telling myself! Note: If you find the dipping difficult (I do!) 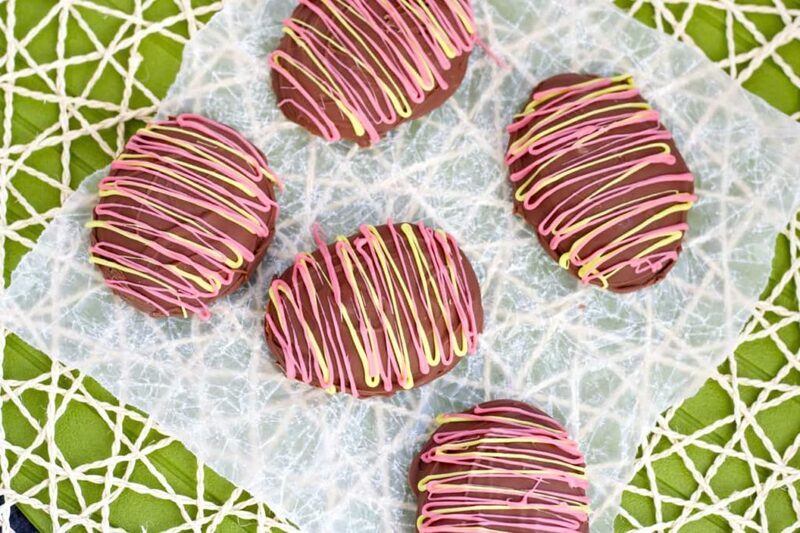 then you can also scoop the melted chocolate onto the “eggs” on the baking sheet and smooth the chocolate over top, coating it completely. Let this set and repeat on the backs of the “eggs”. If you do this, melt the chocolate half at a time so it doesn’t seize when it’s re-melted. Line a baking sheet with wax paper and place the pretzels on it, in stacks of 2. In a small bowl, using an electric hand mixer, whip together the peanut butter, butter, powdered sugar and brown sugar until smooth and well combined. Scoop out about a tablespoon of this mixture and place it on top of one pretzel stack. Using damp hands, press the peanut butter mixture down to cover the pretzels, and shape it into a flat oval shape, about 1 cm (1/2 inch) thick. Repeat with the remaining pretzels and peanut butter mixture. Place the tray in the freezer and freeze until firm, about 1 hour. Place the chocolate in a microwave safe dish, and microwave at 50% power for 2-3 minutes, stirring every 30 seconds, until the chocolate is fully melted. Take the “eggs” from the freezer and one at a time dip them in the melted chocolate, allowing the excess to drip off. Lay back on the wax paper to set. Melt the white chocolate and divide it into two bowls. Tint each bowl a different colour (I only needed one drop of food colouring for this small amount), and drizzle each colour of chocolate over the tops of the “eggs” once the chocolate has set. Store in an airtight container in the refrigerator or freezer. Source: Adapted from Crazy for Crust . I absolutely love that you added pretzels. BEST DECISION EVER! I can't even buy the eggs at the store...these would be equally as dangerous. I know right? I totally hid them in the freezer in the basement and have had to force myself not to go polish them off! Stupid dangerous candy! :) Thanks Dorothy! I love everything about these eggs, the salty sweet combination just can't be beat! These look so adorable! 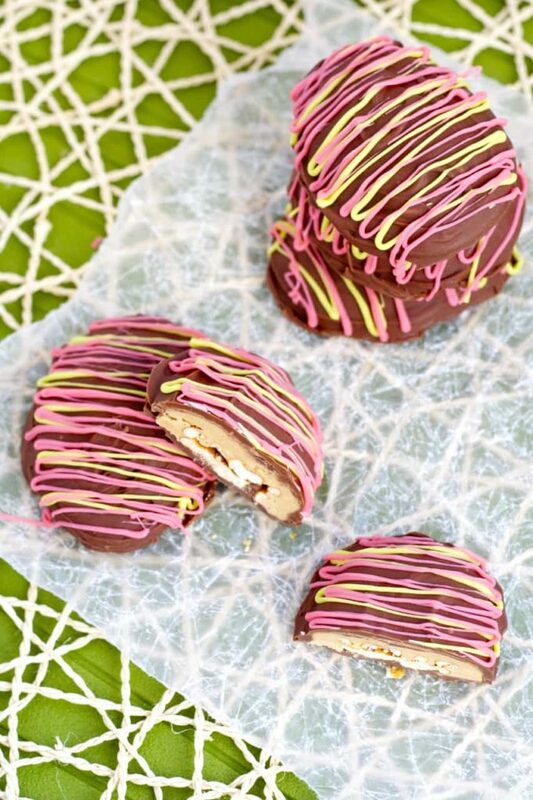 I used to love those peanut butter eggs from the store but I can just imagine these homemade ones would win me over any day! The pretzels sound perfect in here! I love PB eggs, and adding pretzels just makes them soooo much more irresistible! Well I know for a fact that it would be VERY dangerous to have these around me! I don't think I'd be able to share. 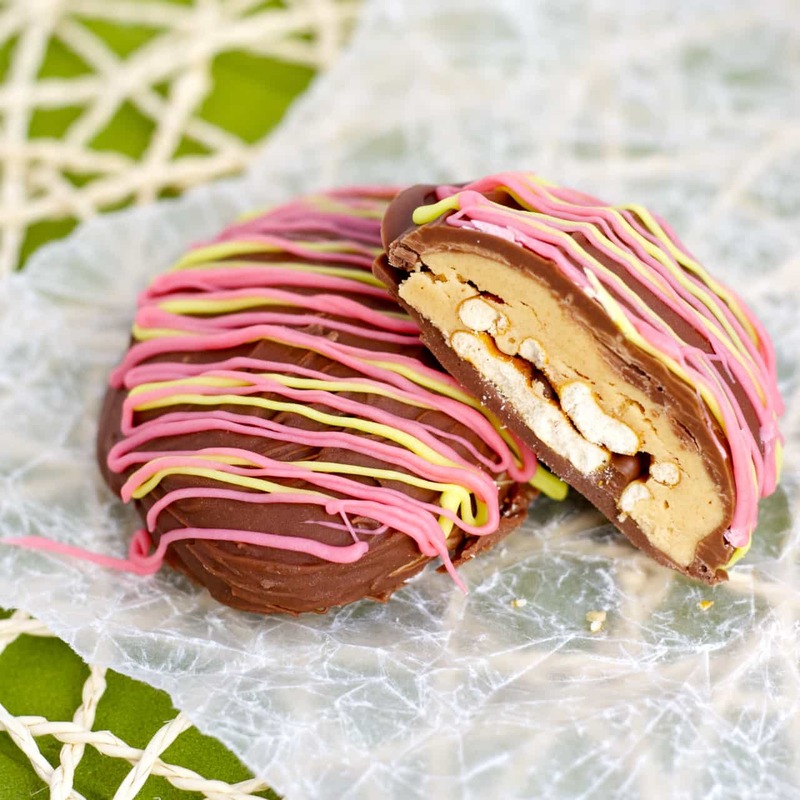 ;) I LOVE peanut butter eggs and I think you just convinced me to try 'em homemade! Thanks Sarah! They're amazing, you'll love 'em! Sweet and salty is the best! Thanks Medha! For some reason, the egg version just tastes better! Maybe a bigger peanut butter to chocolate ratio? Who knows! But what I do know is that these eggs are the cutest, and I love the pretzel addition! So good. Yeah, peanut butter, chocolate and pretzels are generally a dangerous combo! Thanks Ashley! i can just imagine the crunch factor of this right now. biting in and tasting the creamy sweetness and then crunch crunch crunch of the pretzel giving it amazing texture! These are adorable Stacey!! I've only made candy one time and it was a disaster. Did not turn out well. These look easy enough and delicious. I love the added crunch from the pretzel. I love the sweet and salty aspect. Yum!! Your kids are going to love them in their baskets, thats if there are any left, hehe! Pinned!! Pretzels DO belong in sweet treats! But I've never shoved them in cookies, what have I been thinking?! Need to do that ASAP! :) Thanks so much Ashley! Stacey, these are just about the cutest eggs ever! I love the pretzel and peanut butter combo! And the pretty drizzle on top is just perfect. Love it!